Russian preacher; born at Zamoscz, government of Lublin, Poland; died at Slonim 1827. He was a pupil of Elijah Wilna, and, besides possessing great homiletic talent, was a Hebraist and a Talmudic scholar. He wrote: "Safah le-Ne'emanim," a concise Hebrew grammar for beginners (Lemberg, 1793); "Afiḳe Yehudah," a collection of homilies, of which only the first volume, containing twenty-four sermons, appeared (ib. 1802); "Me Neftoaḥ," a commentary on Maimonides' introduction to Ṭohorot (Byelostok, 1816); "Mayim Ṭehorim," a commentary on Ṭohorot (ib. 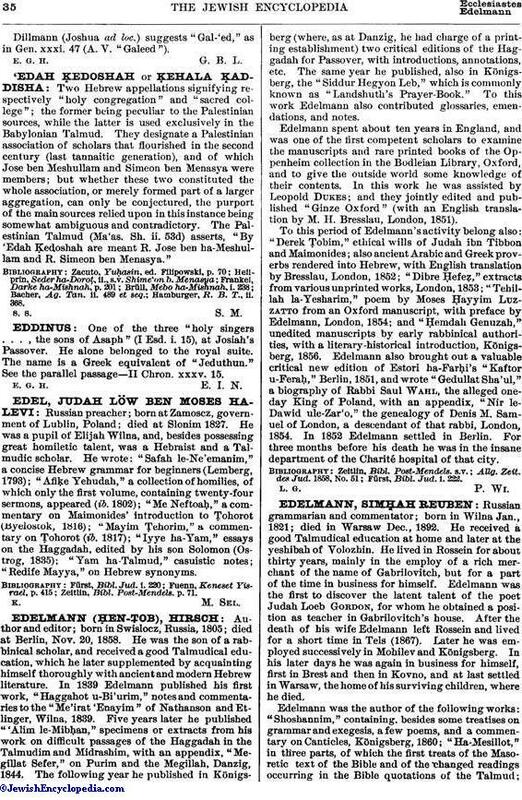 1817); "Iyye ha-Yam," essays on the Haggadah, edited by his son Solomon (Ostrog, 1835); "Yam ha-Talmud," casuistic notes; "Redife Mayya," on Hebrew synonyms. Zeitlin, Bibl. Post-Mendels. p. 71.